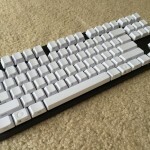 I’ve added some photos at the bottom of the page; I got the keyboard with the white PBT keys, front printed, black case, no backlight (Gateron Brown switches). Scroll down and check out the pics! I’m thinking about selling this keyboard, not 100% sure but I’m open to offers. Just personally don’t like the feel compared to my Filco, it’s all 100% working as it should be. Also, updated August 1st, I seem to have been able to un-pair my devices successfully. See pairing below. And so my new-found mechanical keyboard itch has been scratched again. 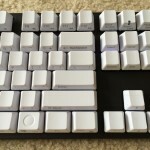 Thus begins the testing of my newly arrived Varmilo keyboard! I’ll make some notes about the keyboard, and then share some function key functionality I’ve discovered. 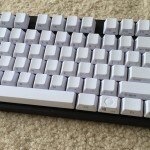 I ordered a Varmilo VB87M model Bluetooth 4.0 (word is Bluetooth 3.0 computers will not be compatible) keyboard from Massdrop last month, and it just arrived today. When I got home from work, I got it out of the box, charged it a bit, and paired it. (As I type this, the “drop” for this keyboard is available again for 10 more days!) 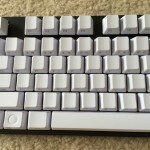 My version of the keyboard has a black casing, white PBT plastic keys with gray lettering printed only on the front face of the keys, and it has Gateron Brown switches with no backlight. There are several different options for coloring, switch type, and backlight available. I might get around to posting some pics at some point. Once I’d tested it on my Surface Pro 3, I paired it with my iPhone, and it works pretty well there also. Unlike my Filco Majestouch Convertible 2 (and here and here), it seems to have a shortcut for the Home button; but sadly, no way on the keyboard to press Send, for example in the Messages app. Will take some getting used to with the Gateron Brown switches I selected (instead of Cherry MX Brown like my Filco), though I do like the front-printed keycaps that can’t be worn off. Overall the keyboard feels a bit cheaper than my Filco (and it was), but since it’s tenkeyless (TKL), and still Bluetooth (Bluetooth 4.0 only), it should be a bit easier to carry on a daily basis than the Convertible 2. The keycaps are a bit slippery on top compared to what I’m used to, and the keys are a bit shorter and flatter than the ones on my Filco. I already put some spare O-rings on the keyboard and it was extremely easy. Keeps it a bit quieter when typing, as it was louder than my Filco started out I believe. How do I know when the keyboard is fully charged? How do I un-pair one or all devices to start pairing fresh? Can I select a paired device among multiple devices directly, or is it pair-order and based on currently nearby devices only? (I suspect the latter). How many total devices can be paired to the keyboard? Here’s the rest of what I’ve learned so far. I’ve tried to put it in a reasonable order, and this is from experimenting so I’m probably missing something. Feel free to comment if you have some notes to add, or any corrections where I’ve misinterpreted something or haven’t fully discovered all the features! 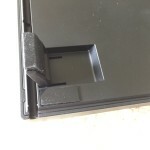 Besides a small directions/manual pamphlet and the keyboard, in the box was also a USB cord (removable, used for charging ONLY and not to connect the keyboard for typing), and a small keycap pulling tool. 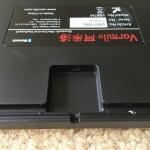 The battery is an internal rechargeable keyboard, not AA batteries like the Convertible 2. To pair the keyboard, press Fn+Insert and the blue light under the Insert key should start blinking. It’s in discoverable pairing mode now. (Note, when I say Fn+Insert, I mean press and hold the Fn, or Function, key to the left of the right-hand Control key, and press the Insert key before letting go of both.) Locate the keyboard’s model name, VB87M, in your device’s Bluetooth discovery area, and select it. Type in the numbers indicated on the screen and press Enter. 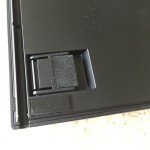 The light under the Insert button will turn solid when paired, the keyboard should be usable now. OK, so to change paired devices, you press Fn+Right Arrow, then Fn+Insert (or maybe just make sure all already-paired devices are off or out of range) and it will disconnect and go into pairing mode, or if there’s a second device already paired, it will switch to the other paired device if it’s in range and the device is more recently paired. It appears that if the most recently paired device is on, it will always try to reconnect to that device after you disconnect with Fn+>. If that device is unavailable (Bluetooth is off, for example), it will pair with an earlier-paired device instead. Thus, since I paired my computer first and phone second, I can turn off Bluetooth on my phone and it pairs back with my computer. Once paired with my computer, it stays paired unless I disconnect with Fn+Right Arrow and then it will pair with my phone again, if available, every time. If I turn Bluetooth off on my phone while paired, and my computer is on, it will reconnect to the computer immediately with no further action (the Insert light blinks when it loses phone connection, then turns solid when it gets computer connection back). To turn the keyboard off, hold the Insert button by itself for about three or four seconds until the light goes out. To turn back on, press Fn+Insert briefly. The keyboard will connect to the last-connected device if it’s available. You may need to wait a few seconds after turning off before it will turn back on. When the keyboard is charging, it seems that the Insert light blinks, even when the keyboard is powered off (however, the on/off toggle still turns the keyboard on and off while charging). If you happen to have one of these keyboard with backlit LED lights (mine doesn’t have this feature, and the light behind the Insert key doesn’t seem to be controllable/dimmable), the Massdrop discussion seems to show that Fn+Up and Fn+Down arrow keys change the brightness between four different levels. To un-pair the keyboard, I’m not 100% sure how to do this but either holding Fn+Delete down for several seconds until the Scroll Lock LED blinks, or holding Fn+Right Arrow, seems to have prevented the keyboard from pairing with my devices and sent it back into pairing mode. 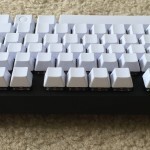 I tried this after reading about a similar keyboard model review on Reddit (of a 60% Varmilo keyboard, the VB660M), even though it’s a bit different and has a wired mode (this one does not appear to go into wired mode, even with Fn+Delete). Shift+Arrow Keys select text in any direction, much like you’re used to in Windows. Home/End/Pg Up/Pg Down do not seem to have any effect on iOS. As I mentioned above, I haven’t found a way to activate the Send button in Messages or Mail from the keyboard, if there is one (on my Filco either). I’m using an iPhone 6 with iOS 8.4 for my testing; the manual booklet appears to show that the controls for Android are similar to iOS. Fn+Delete does NOT appear to switch into a wired mode with the USB cable attached. Holding Fn+Delete (or maybe Fn+Right Arrow, I tried both) appears to un-pair the keyboard, and in fact Fn+Delete makes the Scroll Lock LED blink a few times if held down for several seconds. But I don’t know precisely what this does beyond the Scroll Lock LED blinking! Fn+Esc: Open new window of default web browser. The instructions say that Fn+Delete means something, but I haven’t figured it out yet. I wonder if it has something to do with forgetting all pairings, but I haven’t managed to get it to do anything I’ve noticed yet. Also, I mostly haven’t mentioned that if you press the Fn key and several other keys you can activate some of the secondary-printed functions on the key caps. I’ve focused on the things that are unlabeled. But fn+Control (Right) is the Application (right-click menu) key, for example. And there’s a Windows key on both sides of the keyboard, but Fn+Windows says it’s “Lock” but it hasn’t done anything noticeable for me on Windows or iOS. Some of the above key combinations, but not all, are hinted at in the foreign-language directions sheet. 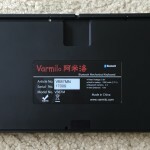 So that’s how to use the VB87M Bluetooth 4.0 keyboard from Vermilo. I’ve still got a few days to see how I like it compared to the Filco (I think I like the Filco better in general), but it seems to be a solid keyboard, even though the multi-device selection seems more on par with the Filco MINILA Air TKL rather than the Filco Convertible 2 (but I wasn’t expecting any multi-device support when I ordered, and what’s here is livable). We’ll see how carry-ability improves with the smaller size of the TKL form-factor. Thanks to Varholiaglimp, NYR99, compuguy, and a few others in the Massdrop Discussion around this keyboard for pointers and tips about some of the above functionality! Also thanks to the instruction booklet, which had some useful pointers even though it had barely any Latin alphabet characters in it. I got a request for some photos of the keyboard in the comments, so here’s a few. I didn’t snap any pics of the box or other contents, but it does come with a small key puller and a USB cable with a nice velcro strap for winding it up, and that’s it beyond the small folding manual with very little English.